Slash calls Guns N' Roses' Chinese Democracy "a great statement"
MusicRadar users voted Axl Rose as the best vocalist to join Velvet Revolver. And perhaps Slash is in agreement - the guitarist has surprisingly kind words for Chinese Democracy, the Guns N' Roses album Axl has labored over for well over a decade. Maybe he wouldn't mind playing the songs live. "So I listened to it: It's a really good record. It's very different from what the original Guns N' Roses sounded like, but it's a great statement by Axl. Now you understand where he was heading all this time. It's a record that the original Guns N' Roses could never possibly make. And at the same time it just shows you how brilliant Axl is. So it was a relief for me to actually hear it." 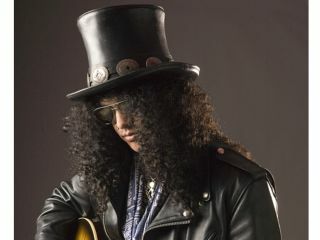 Nine tracks off the album have already been leaked onto the Internet, and Slash had harsh words for the perpetrator. "When somebody takes somebody's work and releases it prematurely just to become famous, it's an incredibly selfish and criminal thing to do. A record is a piece of art. And it shouldn't be released until the creator decides to release it - and I don't care how long it took to make it." While Slash remains staunchy committed to Velvet Revolver and their search for a new lead singer, he looked back fondly at his early GN'R days. "I think what was great about Guns N' Roses is that we made it on our own integrity and we didn't give up anything to anybody and made it on our own merit. The early gigs didn't pay well at all. We actually looked forward to getting paid after a gig, but it was usually for the beer. I kept a straight job for a while." On the subject of current bands, Slash cast a dim view on their need for instant stardom. "Everybody else is making compromises and concessions so that they can make it big and get their picture on the cover of Teen Beat or Us Weekly or whatever. There's a sort of, kind of, selling out to that."